Heat Seal's newest innovation to the hand wrap line. On a percentage basis, the Energy Smart® savings represent a 75% to 85% reduction in the energy consumed per unit per hour. That means your store could be saving $300 annually for the life of an Energy Smart® Wrapper. The Energy Smart® technology was developed to provide directionally focused, on-demand heat to the package to seal the film. This was to meet the productivity and quality needs of the customer and to create a more energy efficient seal plate. The seal plate accelerates from ambient temperature to 350º F in 3 seconds or less. This technology allows associates to meet productivity demands while at the same time only consuming energy when needed to seal a package. UTILITY REBATES AVAILABLE - In addition to saving money on energy costs, rebates are available for the Energy Smart Wrappers in many markets. Contact your utility representative and ask about custom rebate programs, provide the Southern California Edison Report. We've seen rebates from $40-200 per unit. If you have any questions about rebates, please contact Heat Seal for assistance: (216)-341-2022 or email sdutton@heatsealco.com. The cradle mount system makes film changeover faster and easier than the axle mount systems with no initial assembly needed. The new cradle mounts have been designed and tested to use every inch of film down to the core! 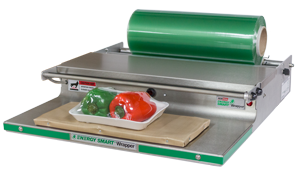 A staple in supermarket meat departments, hand wrap machines have been used for over 60 years to create clear, leak resistant packages for cuts of meat, seafood, produce and cheese. Old style units are using energy constantly, typically 24/7. 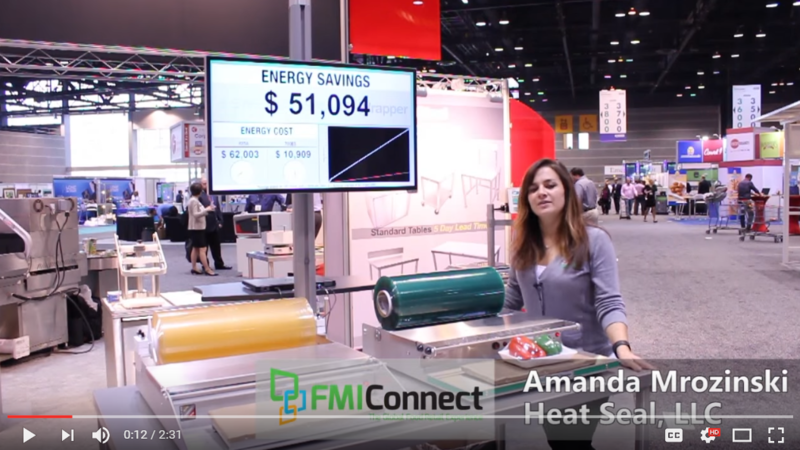 Using Heat Seal's innovative on-demand sealing technology, the Energy Smart® units tested show that the wrapper reduces energy consumption by 80%. Energy is consumed by the seal plate only when store associates need to seal a package. The new units provide significant energy conservation by no longer requiring the seal plate to be energized throughout the day. Take your commitment to energy conservation out of the operator's hands and make saving energy simple with Energy Smart® wrappers. Don't take our word for it, experience it for yourself, we'd be happy to send you a test unit. Contact Stephanie at (216) 341-2022 ext. 208 or email sdutton@heatsealco.com for more information.